This guidebook will fit snugly into your jacket or rucksack pocket and you can hold it one hand as you consult it along the way. Kev Reynolds effectively balances the requirements of route fining instructions and personal commentary, his personal style being enthusiastically poetic! The introduction leads you quickly into the Cotswold scene, with sketches of the history and the geology of the area, and an outline of the route. Reynolds divides his route finder into twelve sections, though this is for the benefit of the leisurely stroller. For the average long distance walker, who will probably not want to take more than a week, a chart suggests seven stages. There are descriptions of the route taken from both the north and the south. Instructions are detailed and helpful. They are supported by black and white sketch maps, though Reynolds himself advocates the use of larger scale maps and specifies the ones you require for each of his sections. At the end of each section, separate from the route finding instructions, Reynolds draws your attention to points of interest along the path. 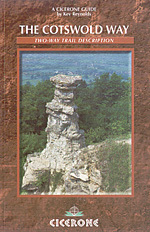 The book is illustrated by a small number of black and white photographs and a couple of pages in colour, one of which is a particularly fine close-up of the Devil's Chimney. Walk with Kev Reynolds and be uplifted by the inspiration of his poetic appeal. "One moment," he promises, "you're wandering high along the scarp edge with toy-like farms and cottages speckling the lowland plains far below, the next you're heading down to them - down to explore a magical village or small market town with age in its streets, charm in almost every window ... If you open your eyes, heart and mind to the splendours of that world, you'll grow richer by the day." Who could say no?